Friday September 6 1907 Miss [Weise?] came to sew today we worked on the skirts I had ready. I wrote to the girls at Colorado Springs tonight. It is 25 years tonight since John & Callie McCollister were married we were invited down there to a party but could not go. Saturday September 7 1907 I was busy helping sew every moment I had to spare from the house work Will went to town in the forenoon. I bought a couple more shares of abstract stock today. Mrs Smith and Gertrude called late in the afternoon. Weather pleasant. Sunday September 8 1907 It is 27 years today since John & Hattie were married. They are having a good time at Colorado Springs. I was busy all forenoon with the work. Ott & William were out for dinner. They did not stay long. Will and I went down to see Mary she got home Friday night. Came home in time to do evening work. Weather cool. 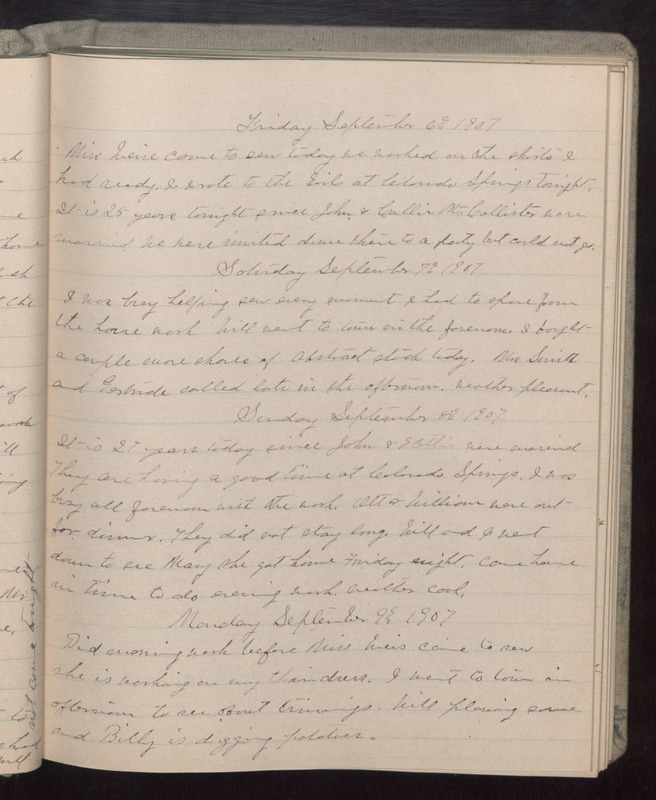 Monday September 9 1907 Did morning work before Miss [illegible] came to sew she is working on my [thin?] dress. I went to town in afternoon to see about trimmings. Will plowing some and Billy is digging potatoes.